PUBLISHER - H.F. WENDELL & CO. This week's Photo Of The Week is not a photograph, but is classified as a category of Cabinet Card known as a Remembrance/Mourning/Funeral Card/Obituary Notice. 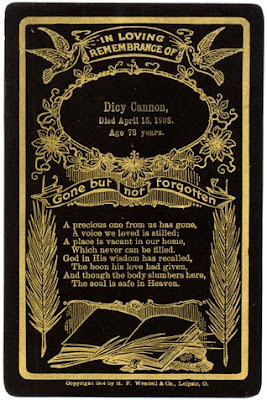 I purchased the card in an antique store in Montana because of the unique name of the deceased - Dicy Cannon. Dicy sounded very southern to me and I wondered how her mourning card was for sale in Missoula, Montana. Copyright 1904 by H.F. Wendell & Co., Leipsic, O.
Dicy Cannon was born Dicy Smith, 16 November 1829 in Dixon, Dawson County, Georgia. She lived with her parents John and Mary (Mollie) Smith until she married Moses Columbus Cannon, 3 October 1850 in Lumpkin County, Georgia. In 1860 Dicy and Moses are prosperous farmers in Sanford, Georgia. They have three children; James (8), David (4), and Mary Ann (1). On 13 October 1861, Moses enlists in the Confederate Army, Company L, 38th Infantry Regiment Georgia. For the next three years he is involved in many of the famous battles of the Civil War; Fredericksburg, Chancellorsville, and Gettysburg. The records indicated he was still on active duty as of 1864 when he was promoted to Full 4th Sergeant. By 1870 the farm has increased in value and Dicy and Moses have added two children, Jane (10) and William (3), to the family. All five children are living and working on the farm. 1880 finds the family farming in Coal Mountain, Georgia. Only Mary Ann and William are living at home. James has married and left home, David occupies the farm next to his father with his wife Malinda, and Jane's whereabouts are unknown. Big changes have occurred by 1900. On 19 June 1900, seventy-five year old Moses is living with his son James in Sanford, Georgia on what appears to be the original family farm. Occupying the family home are James' wife Emily and their four children. Moses is listed on the census as married but is not living with Dicy. She is living in Montana with their youngest son William. David and his wife Malinda and their four children have moved to Ravalli County, Stevensville, Montana where William and Dicy are found. William is farming, but David is working as a teamster. On 24 August 1901, Moses dies in Georgia and is buried in the Liberty Baptist Church Cemetery, Dawson County, Georgia. Seven years later on 15 April 1908, Dicy dies in Montana and is buried in the Maplewood Cemetery in Stevensville. In 1910 James is found living with his wife Emily and daughter Anna in South Seminole, Oklahoma just down the road from their son Wallace and his family. William and David continue to live and work in Stevensville until their deaths. Also buried in the Maplewood Cemetery in Stevensville, Montana is Mary Anne Cannon. I have no information to substantiate that this is Dicy's daughter, however, she is of the correct age. Invoking that six degrees of separation rule, my son is now living in Stevensville, Montana and has agreed to go to the cemetery to try to find Dicy's grave. 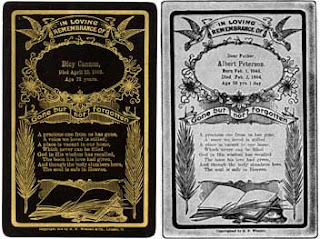 The three most common types of mourning cards are (1) the obituary notice, printed in gilt, on a black card mount, with or without a portrait; (2) the memorial card, usually with an oval portrait, surrounded by a printed wreath, generally with the name of the deceased and dates of birth and death, sometimes with a vita printed on back; (3) a portrait mounted on a card with a rectangular or oval heavy frame printed in black, usually with name of the deceased. Dicy's mourning card is a combination of the obituary notice and the memorial card. It has no photograph, is black with gilt lettering, lists the name, age, and date of death, and is surrounded by a wreath. It was printed by H.F. Wendell of Leipsic, Ohio, a well-known producer of mortuary cards. Harry F. Wendell started in business in 1888 in Leipsic, Ohio, and within three years his was the largest business of its kind in America. Wendell had formerly been the publisher and editor of the Leipsic Tribune and was a member of the City Council. He led a very busy life holding the following offices: Vice President and Director of the First National Bank, Secretary and Director of the Dollar Oil Company, Secretary and Director of the Putnam Hosiery Company, President and Manager of the Wendell Printing Company, President and Manager the Carriers Greeting Company, Secretary of the Board of Trade, and President of the Law and Order League organized to promote the moral welfare of the city. Whew! There were eleven styles of cards advertised with a selection of forty-six different verses in six languages. Dicy's sons would have sent for the cards by mail order after having made their choice. 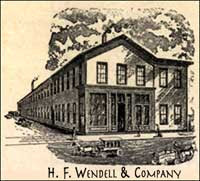 Wendell's was a mail order business including a form with each of their catalogs. It is unknown if the family had requested a catalog or if the funeral home provided the information to the family. Wendell's also sold envelopes so that the family could have mailed the card to James in Oklahoma. One entire section of the Company's pamphlet is devoted to satisfied customers. I was very taken by the comments of H. W. Musselman of Silverdale, Pennsylvania. "Cards received safe and sound. Expect to send another order later on." The card that was chosen was No. 2 in the catalog, as shown below. The above is a very attractive card. An open book lies at the bottom and palms appear at the sides. A beautiful wreath of flowers encircles the name of the departed. Two beautiful doves appear at the top. Two verses may be used without extra charge by omitting the book. Finished in gold or silver. The words, “our Dear Father,” are not printed unless ordered, and may be changed to “our Dear Mother,” “Our Dear Son,” or any other wording. Any berse in this catalog may be used. Cards may be black, white or assorted. Price – One Card 20c. 2 for 35c. 4 for 50c. 6 for 65c. 8 for 75c. 10 for 90c. 12 for $1.00. 15 for $1.20. 20 doe $1.40. 25 for $1.75. 35 for $2.30. 50 for $3.00. 75 for $4.00. 100 for $5.00. 150 for $7.00. 200 for $8.00. Postpaid. The above style may be had 6x91/4 inches in size at the following prices: 1 for 35c; 2 for 55c; 4 for 75c; 6 for $1.00; 10 for $1.45; 12 for $1.60; 15 for $1.90; 20 for $2.25; 25 for $2.80; 35 for $3.75; 50 for $5.00; 75 for $6.75; 100 for $8.00; 150 for $12.00. In Twice Told Tuesday this week, the Wendell Catalog will be reproduced. It will be of great assistance to the family historian in understanding the mourning customs of the time. 1860 U.S. census, Dawson County, Georgia, population schedule, Crossville, p. 88, dwelling 11, family 11, Moses C. Cannon (Head); digital images. Heritage Quest (http://persi.heritagequestonline.com/ : retrieved 23 May 2008); citing NARA microfilm publication M553, roll 119. 1870 U.S. census, Forsyth County, Georgia, population schedule, Coal Mountain, p. 513, dwelling 108, family 692, Moses Cannon (Head); digital images. Heritage Quest (http://persi.heritagequestonline.com/ : retrieved 23 May 2008); citing NARA microfilm publication M593, roll 146. 1880 U.S. census, Forsyth County, Georgia, population schedule, Coal Mountain, p. 455, dwelling 116, family 116, M.C. Cannon (Head); digital images. Heritage Quest (http://persi.heritagequestonline.com/ : retrieved 23 May 2008); citing NARA microfilm publication T9, roll 147. 1900 U.S. census, Dawson County, Georgia, population schedule, Sanford, p. 287, dwelling 180, family 183, James T. Cannon (Head); digital images. Heritage Quest (http://persi.heritagequestonline.com/ : retrieved 23 May 2008); citing NARA microfilm publication T623, roll 191. 1900 U.S. census, Ravalli County, Montana, population schedule, Stevens Township, p. 59, dwelling 167, family 169, Wm. 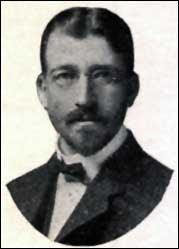 E. Cannon (Head); digital images. Heritage Quest (http://persi.heritagequestonline.com/ : retrieved 23 May 2008); citing NARA microfilm publication T623, roll 914. 1910 U.S. census, Ravalli County, Montana, population schedule, Stevens Township, p. 217, dwelling 156, family 164, Wm. E. Cannon (Head); digital images. Heritage Quest (http://persi.heritagequestonline.com/ : retrieved 23 May 2008); citing NARA microfilm publication T624, roll 833. Dodd, Jordan. 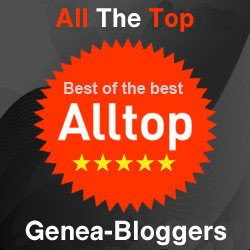 Georgia Marriages to 1850 [database on-line]. Provo, UT, USA: The Generations Network, Inc., 1997. Original data: Electronic transcription of marriage records held by the individual counties in Georgia. Historical Data Systems, comp.. American Civil War Soldiers [database on-line]. Provo, UT, USA: The Generations Network, Inc., 1999. Original data: Data compiled by Historical Data Systems of Kingston, MA. What a brilliant post, as usual! And what a huge amount of research went into it. I have learned so much from you, and it is just so enjoyable too! What an interesting family story --- and thanks for the information about mourning cards. While I appreciate the information about the cards and their use, the family history you wove into this article is most touching. I do hope that someone from this family who knows the "rest of the story" will share with us. Maybe the separation of Dicy and Moses about 1900 and then their deaths and burials so many miles apart was not an indication of love lost but of duty and responsibility --- or of health issues which forced the separation. She passesd on when is grandfather was only less than a year( he was adopted out). It is so interesting to find out something about the card it self. I have not been able to find out anything about her. Glad this came around again, so this newbie has the opportunity to enjoy the fruits of a super researcher and writer. So glad you are enjoying some of the work of Shades. I do enjoy it here. And thank you for the "super" designation, but I'm just learning with the rest of you.